Worthy Waites of Whimsey battle the winds and plunging temperature (note the tambourine "wind shield" in the photo) to deliver a spirited performance at Sunday's TCMF! AUSTIN — Sunday, May 1, a “Blue Norther” blew through Central Texas with high winds and a 30-degree temperature drop! 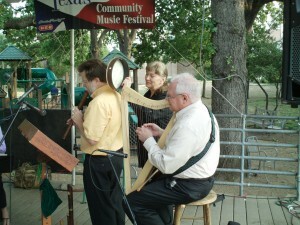 And the SHOW WENT ON at the Sixth Annual Texas Community Music Festival. 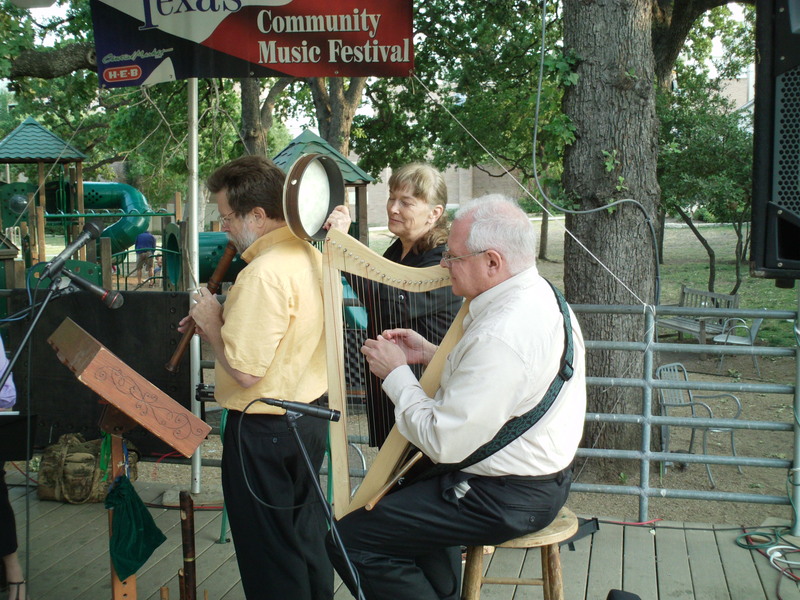 At 1:15pm, the mercury was in the upper 80s, and the San Gabriel Horns were onstage, after performances by the Chaparral Dixielanders and Los Klezmeros. By the time Monster Big Band took the stage, the temperature had dropped into the low 50s and music lovers were huddled together under blankets. BUT THE MUSIC WAS HOT and the audience was warmed by one outstanding performance after another. After the Hill Country Community Band of Wimberley made their sixth straight appearance (one of a few bands that have played all six TCMFs), Silver Thistle Pipe and Drums marched onto the stage and previewed the program they’ll be playing in Scotland at the World Championships this summer. And the winds rose, like they were howling down from the Highlands themselves. By the time the Austin Jazz Workshop had finished its awesome set, the sun broke through (jazz tends to do that) but the temperature kept plunging, right through the Band of the Hills, who performed with more than 70 musicians on the Cafe patio, and the Worthy Waites of Whimsey, winners of the “Most Courageous Ensemble” of TCMF so far. The evening culminated with the incomparable Monster Big Band. TCMF continues Monday at 5:30 at Central Market North. Check the schedule for more details.